The recent development of the discipline of Childhood Studies allows us to look at the Child as socially constructed in the same way as Woman or the Native, as a set of ideas that control the way that children are perceived and described in different discourses. Looking at these novels from the perspective of Childhood Studies I wish to discuss the reasons why the child of Romanticism has become such an important, though eminently sacrificeable, character of the postcolonial New Zealand novel. 2Children’s Literature in Nineteenth Century India: Some Reflection and Thoughts. “Little Red Riding Hood” is perhaps the archetypal children’s story. At the same time, it is a story that captures the imagination of authors and illustrators for both adults and children, as well as readers of all ages. From its origins in the oral tradition, the tale has been a crossover work and authors have been “crosswriting” it for an audience of adults and children since its literary début in France in the seventeenth century. This paper analyses a selection of multi-layered retellings of “Little Red Riding Hood” that were written and published for, or are read by, a dual audience of children and adults. 11“Helpless and a cripple”: the disabled child in children’s literature and child rescue discourses. 12Pip and Hawkins: the spontaneous generation of two mistakes of fiction. 13No back agency on the back seat: the Watsons go to Birmingham-1963. The Watsons Go to Birmingham, 1963 is a highly popular 1995 novel involving a lower middle class black family of five. The father, Daniel, is a factory worker in the automobile industry. Wilona, the mother, is a homemaker who moved up from Birmingham as a young bride. Of the three siblings, Byron is about 14, Joetta, the last born, is about 7 and Kenneth, the narrator is about 10. Byron is a troublesome child and the parents decide to drive down to Birmingham to have his disciplinarian grandmother teach him the realities of black life in the United States. The novel is full of humor, especially as Daniel is a nononsense black man while Wilona romanticizes the “down home” of her youth. The overnight drive from Michigan (a challenge Daniel imposes upon himself) is smooth and the family reunion after 10 years is pleasant —although Wilona fails to approve of her widowed mother’s decision to live with a companion. Nice Kenneth is the one who gets out of line and bathes in a dangerous place, only to be rescued by Byron at the last minute. The trauma of the bombing of the 16th Street Baptist church concludes the novel, and the family drive home to protect Joetta from the horror of it all. The essay takes issue with the novel for its silence about the events of the spring of 1963. Apart from the heinous bombing, the book’s overall vision of the racist South is bland. Here is a story written for children which fails to instruct. The “children’s crusade” was a very special movement of the civil rights campaign involving thousands of young protesters who marched, braved police dogs, billy clubs, water cannons, and went to jail because they believed in promises of fairness and equality. Black agency deserves better than the novel’s representation of the past. Racial fairness remains a promise even today, but whatever progress has been made did not come easily. 14“Wrecked at the critical point where the stream and river meet”? : Lewis Carroll and the deconstruction of Childhood. 18Their past, our future: the relevance of WW2 experiences for contemporary children. The paper discusses the time-travel motif in English children’s literature (Lucy Boston, Philippa Pearce, Penelope Lively) as viewed through Deleuze’s theory of difference and repetition. Reflections on time and space in particular stories draw on the tradition of adventure novel as well as on Bakhtin’s theory of chronotopes. 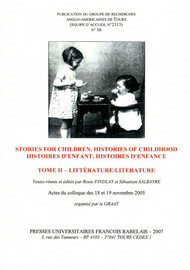 Résumés/Abstracts In : Stories For Children, Histories of Childhood. Volume II : Literature [en ligne]. Tours : Presses universitaires François-Rabelais, 2007 (généré le 26 avril 2019). Disponible sur Internet : <http://books.openedition.org/pufr/4982>. ISBN : 9782869064836. DOI : 10.4000/books.pufr.4982. Findlay, Rosie, et Sébastien Salbayre, (dir..) “Résumés/Abstracts”. Tours : Presses universitaires François-Rabelais, 2007. (pp. 405-416) Web. <http://books.openedition.org/pufr/4982>.